Okay Stella & Dot lovers have I got some great information to pass onto you. If you have ever thought about selling Stella & Dot here is their latest greatest promotion. Being an affiliate I pay be compensated for your purchase from Stella & Dot. 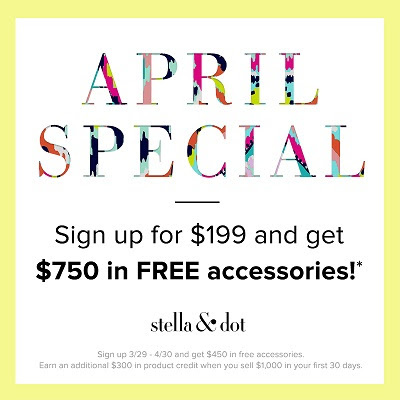 Until April 30th, Join Stella & Dot for as little as $199 and get $750 in free accessories! To top it off they have offered an additional $100 in Sample Credits immediately upon signing up. Think they are done, nope not yet. In your first 30 days if you sell $1000 you will get an additional $300 in product credit. To learn how to become a Stella & Dot Stylist, go here.